The pub now has new owners who actually enjoy serving customers! I can’t disagree with the comments about the previous management as service has been less than enthusiastic in the past but had a couple of excellent pints last Saturday & both house red & white got the thumbs up from both wife & mother-in-law. Lunch was very good too, all three dishes were excellent & as all 3 of us cook & are foodies, the bar is set fairly high. Also very dog friendly in the front bar & our boy loved the attention from customers & staff alike. Will certainly return more frequently now. As promised I followed up my visit of last week (see last comment). Went here yesterday lunch time. The small rear garden was full of older clients eating/drinking and enjoying the sunshine, a few more were eating in the rear dining room. The front Bar was empty but had a nice breeze from the open windows. That was the best this pub has to offer. Very slow Bar service only had one straight pint glass available (duty to party on Sunday aparently), As they do not open on a Monday and have a dishwasher did not understand this comment. Brakspears Bitter was good but the Oxford Gold was Cloudy and undrinkable, so exchanged for another Bitter. Typical Town Pub run by people on behalf of others. ie an Absent Landlord. I suggest you give this one a miss and pop up the road to the Row Barge or one of the other much better pubs in the town. (Note to Landlord please spend some time in your pub and watch what goes on in your absence) Oh and clean your pipes out! 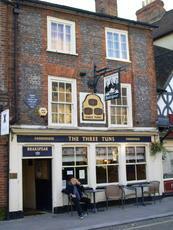 Went here yesterday as part of the "Brakspears Henley Ale Trail" But was dissapointed as it was CLOSED on a Monday!!!!!! Who in their right mind closes Mid Summer on a Hot July Afternoon when Henly was full of Tourists. All I can say is they must make a lot of money when they are open to compensate. (Perhaps the prices are high). I shall return next week on a day other than Monday to report further. The pub is split in two halves with a drinkers bar at the front and a resaurant to the rear. Very nice. A hidden gem. I have a feeling many people walk past this place without really 'seeing' it. Under new management in 2010 I would definitely recommend giving it a try. Unfortunately the Brakespears was 'off' but the cocktails were fantastic. A 'house' twist on the classics, served with an amuse bouche of olives, anchovies and cheese. We stayed for dinner and shared the duck rillet starter - gorgeous, followed by beef daube and loin of venison (the daily special). The daube could have been hotter but both meats were cooked to perfection served with seasonal veggies. My only criticism was the lack of other diners in the restaurant - a real shame... We will definitely be returning...come on locals - give it a chance ..